Japanese architects Y+M Design Office have completed this family house in Japan, with a façade that forms a staircase to the roof. Called Stairs-House, the building can be climbed from the garden at the bottom, up to the roof. Glass slits in between the treads allow sunlight to filter into the house. Inside the house, the stair structure has been left exposed, making the most of the unusual feature. The owner of this house are young couple in their 30’s. They are both teachers and have twins. When they asked us to design their dream home, they had three key themes in mind. One is “people gathering” as they love their students visiting them, another is “warm and bright”,and the other is “protect their privacy”. The land is located at seaside. In winter, it suffers from the strong, cold sea wind and a short number of daylight hours. To the south of the land there is a 3-metre wide road and a 4-metre high bank leading to open ground. From the West is a combination of strong direct sunshine and sea wind. To the North is a road to the local village and to the East is a two-storey house closely. Taking into consideration the owner’s three key requests and the location of the land, we designed this “Stair-Shaped” House as a solution. To allow sunlight into the house, there are a number of glass slits in-between the steps on the south side.The glass slits not only make them feel liberating but also keep their privacy at the same time. The “Stair-Shaped” House makes people automatically look upside. It gives them no oppressing feeling. The stair shaped wall is made of porcelain tiles and, therefore, maintenance free. The outside structure links the garden to the rooftop, and the inside of the house links a private porch/reception/lounge area to the bedrooms. The windows are designed and situated to allow in as much sunlight as possible, whilst retaining privacy. Additionally, the “Stairs-House” achieves the aim of allowing in both daylight and ventilation very efficiently. In summer, the house has a nice breeze blowing through the small garden situated on the south side and removes heat through both opening and ventilation fan on the north side. Also, the slit windows stop the strong, direct sunshine, whilst allowing the indirect reflected light into the house. In winter, this design keeps the house warm by allowing the maximum amount of sunlight into the house, in addition to the comforting warmth from the under floor heating and a wood-fire. 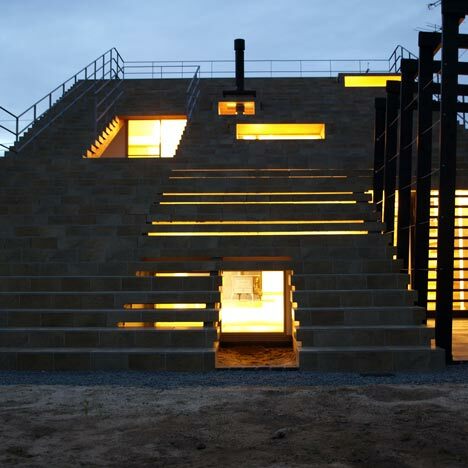 The “Stairs-House” is a perfect solution that can be adapted to any type of climate!